Please inform us by E-mail about your arrival time! For expanding your staying in the accommodation, after checking availability and communication with the owner, extra charge will be applied. Lyxery apartments 1 to 4 bedsApartments by the sea side perfect for couples romantic escapes, family holiday breaks and young one's who want to explore a beautiful Ionian island. Kefalonia is the largest and one of the most appealing islands of the Ionian cluster. Ideal for serene and peaceful vacations, the beauty of the unparalleled landscape of Kefalonia . At the same time, the remains of an ancient civilization create an enigmatic and interesting atmosphere that in combination with the unique mentality of the inhabitants compose an amalgam of excellence. 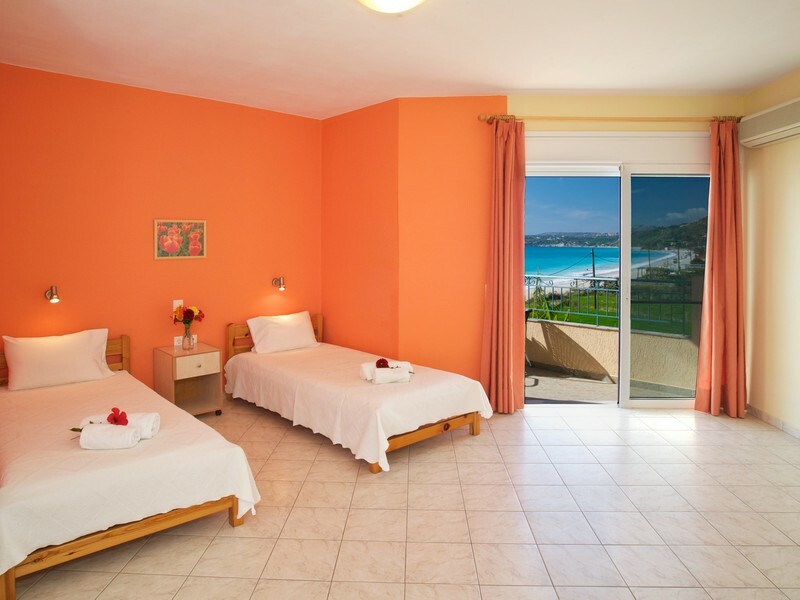 Is a small complex of studios located on the sea side of Lourdas beach. Lourdas village is a resort with a traditional Greek atmosphere ideal for those who want to escape in a beautiful and peaceful paradise in Kefalonia. Lourdas beach is one of the longest on the island, sandy and shingle that stretches for 2km. The nightlife in the resort is relaxed with mainly taverns ideal for families and those who looking for quiet, relaxing holidays. 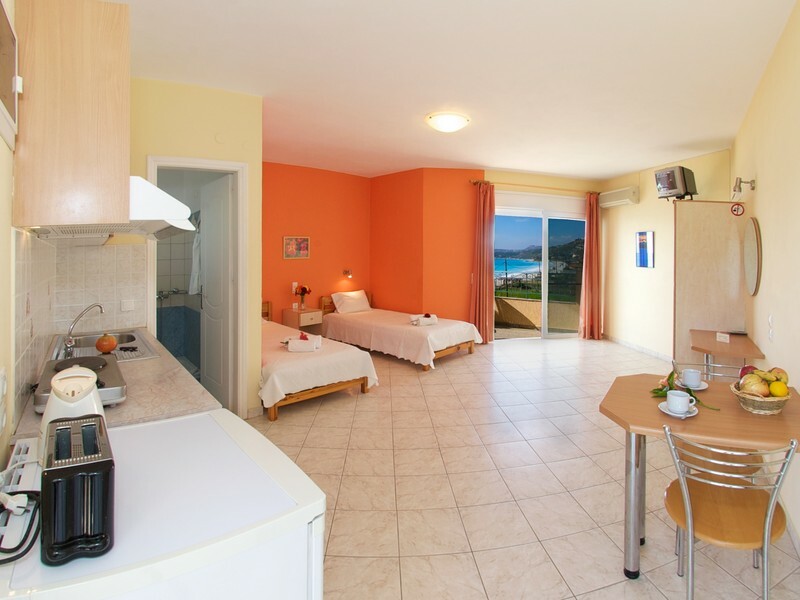 The studios are only 16km for the capital Argostoli and 17km from the Airport. village of Lourdas sits on a steep hillside on the south coast of Kefalonia, about 16 kilometres from the capital, Argostoli. It’s a traditional kind of place with a central Lourdas Bay stretches for more than 2 kilometres along the clear aquamarine waters of the ionian Sea. It’s Blue Flag, and the sand-and-shingle surface shelves gently into the calm, sheltered water. Snorkellers love it, while boating and sea kakaying are also popular activities here. Along the front, you’ve got some lovely little bars and tavernas draped in grapevines, perfect for shaded lunches. al square shaded by a plane tree, with little tavernas and music bars tucked into the streets around it. The pine forest and cypress trees of Mount Ainos make a lovely backdrop. As for the beach below, it’s set in a tranquil bay backed by vine-shaded restaurants. A 40-minute drive north takes you Sami, which has not one but two fantastic attractions. First up is the Drogarati Cave, which is famous for its limestone features. Multicoloured stalactites hang down from the ceiling of a colossal natural chamber that’s large enough to stage concerts in. Then there’s Sami’s Melissani Lake. Boat trips take you around the turquoise lagoon, then underground to see rooftop stalactites and bubbling springs. It’s eerie and beautiful.